We would like to extend a very special thank you to Leslie White and Team at Bernina Sewing Center for hosting us and providing the wonderful table decorations...."Cheery" is the word. You created a wonderful atmosphere and tone for the party. To our Christmas lunch coordinators (code name "Snow Troopers"), Cindy Lammon, Cheryl Brickey and Paige Alexander - you did a "WOW" lunch buffet that was enjoyed by all. And, to our ladies who brought desserts, Elise Dunbar, Michele Blake, Dawn Holter and Leslie White all were "Spectacular" sweet treats.......and tasted fantastic!!!! 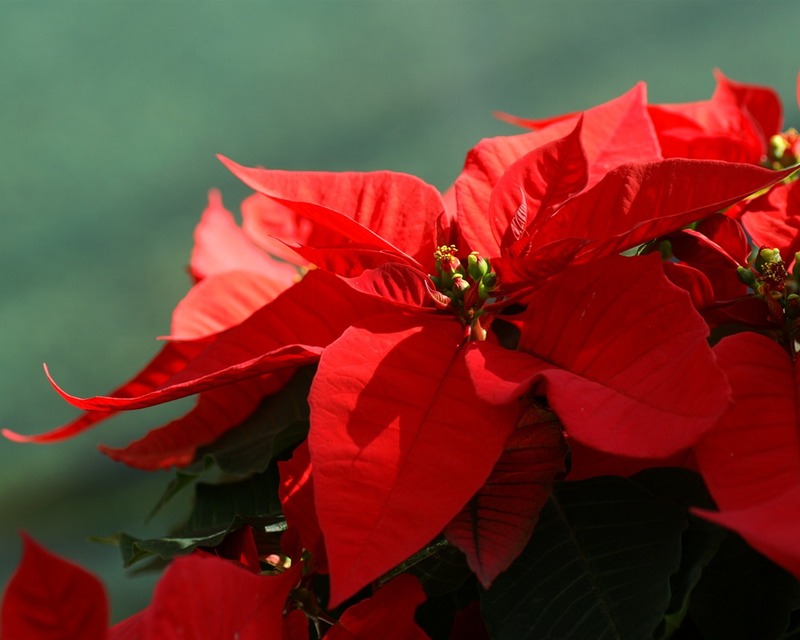 And, most importantly, the key ingredient to the Christmas party...."YOU". Thank you for coming to enjoy. Thank you to all who donated items for this year's GMQG Chinese Auction. It was for a worthy cause -- to raise additional funds for GMQG. We had a varied selection of auction items to choose from that included: two quilts made by Cindy Lammon, two Faye Jones original art pieces, a Bernina $10 gift certificate, Michele Blake Zipper Pouch, Gee Bends Coffee Table Book, an array of quilting material, tools, books and patterns and so much more. For those who purchased $1 tickets, it was a tough decision as we walked around the tables deciding which items to place our tickets. Thank you to all who participated in this year's auction. It was a huge success!!! Cindy Lammon has been an inspiration to us all this year as our 2017 GMQG President. We are so appreciative of her direction and leadership, event planning, organizational skills, and quilting talent. She is truly a remarkable woman. 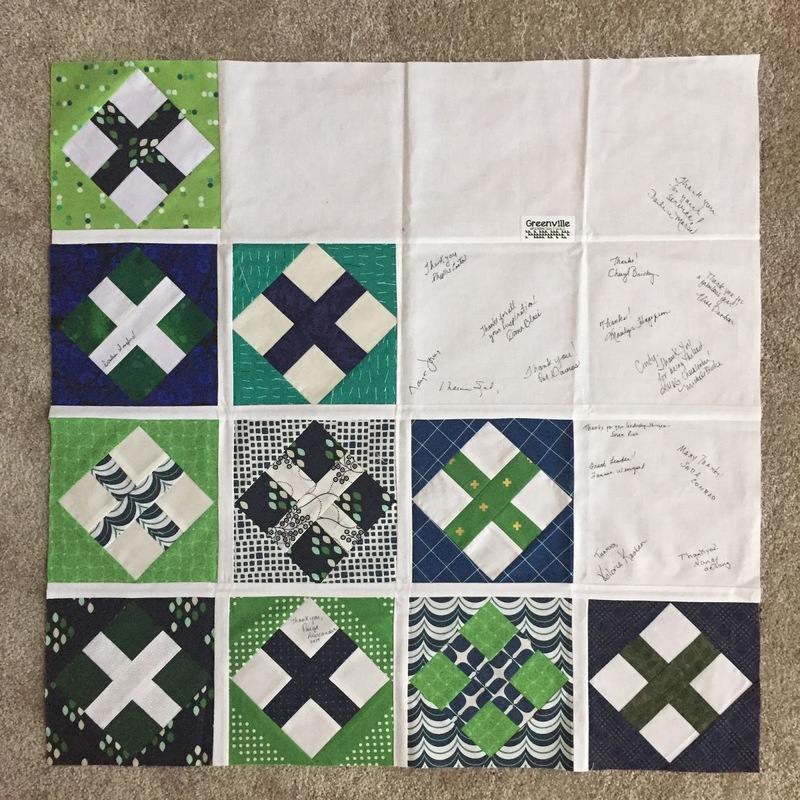 As special gifts to commemorate her time and service this year, the 2017 Board and Auxiliary Board presented her with a gift certificate from the guild along with a quilt wall hanging (which is still a work in progress because it needed our guilds special touch -- "your signatures"). 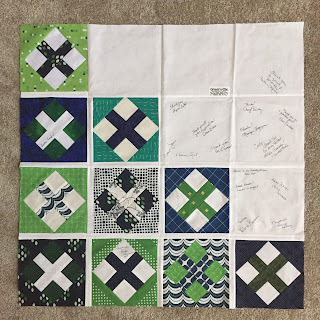 Each quilt square was made by one of the Board and Auxiliary Board members featuring a pattern from Cindy's blog called Kisses using the Plus Block turned on point to create an "X" or a "Kiss". Faye Jones and Cheryl Brickey have donated their workmanship toward the project completion. We applaud you Cindy. Thank you for a great year. Fortunately, for us Cindy will still be on the 2018 GMQG Board serving in her new role as our group Secretary!!!! 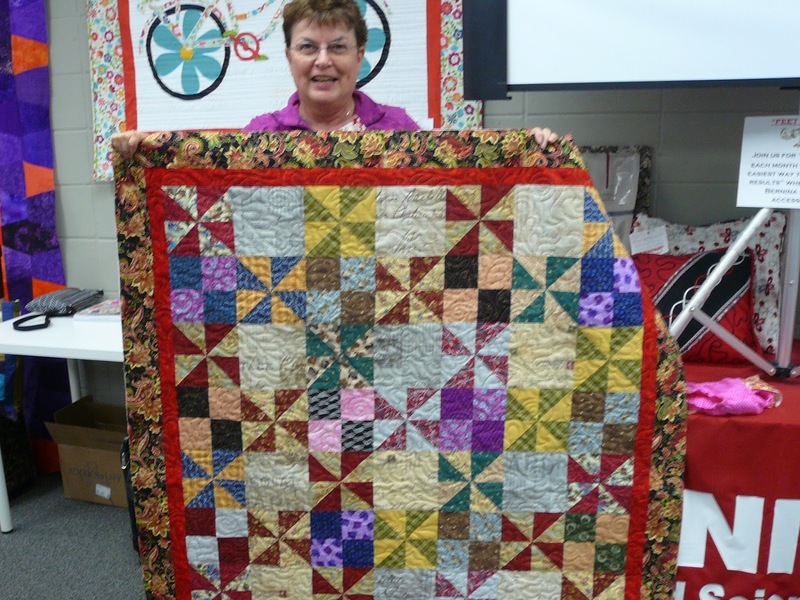 Next Month: January 13th program - Bring your first quilt piece for the "Getting to Know Each Other". More information will be coming as the date nears. There is an Old Wives' tale that claims quilts have a magical power to comfort and and convey love. I think we have seen this in practice at The Julie Valentine Center and in Spartanburg. The quilts you have generously made with love and care are being given to children of all ages who are victims of sexual abuse. The quilts comfort these kids as professional staff evaluate them and devise a plan for coping with the trauma of abuse. We, as individual contributors, do not seek nor receive recognition. 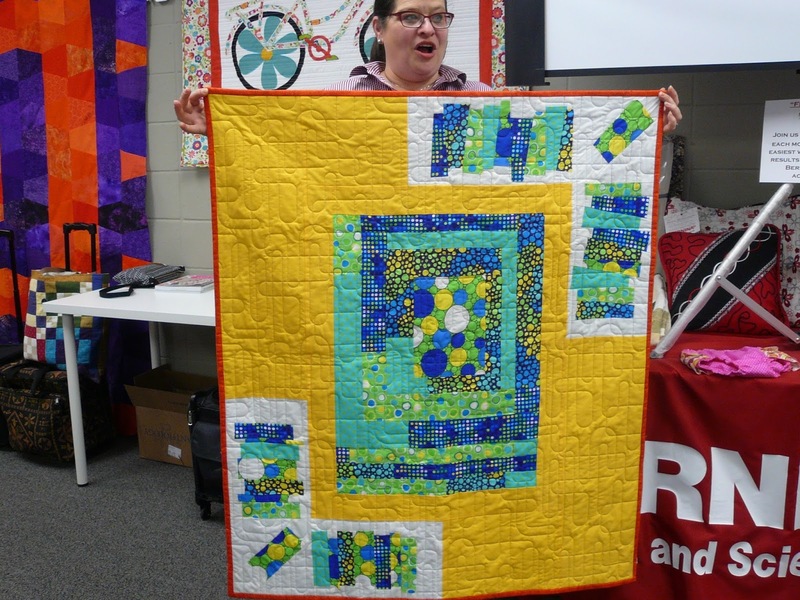 I would like you to know that, as a group, we have donated more than 70 quilts over the less than 2 year life of the project and our quilts have become an integral part of CHAMP (Children's Abuse Medical Program). 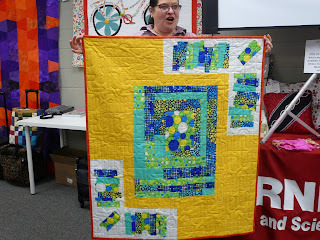 Cheryl Brickey - Quiltcon 2018 -Michael Miller Challenge quilt called "Pop Rocks"
As we conclude 2017, the Board would like to express our thanks for a successful year. 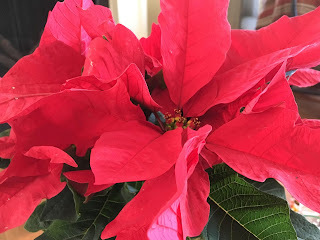 "Merriest" Event of the Year! It all starts at noon with a light lunch and dessert. We will also be having a Chinese Auction. This is where you can buy $1 tickets and then place the ticket on the items displayed that you wish to win. Your odds increase if you place more than one ticket on an item.....it is totally up to you how to strategize it. The proceeds from the auction will go toward GMQG special projects and events in 2018. Participation in the auction is optional, so whether you choose to participate or not, the process is fun to watch unfold. And, last, but not least, bring your Show & Share, BOM and Philanthropy projects, so we can enjoy seeing them. (Optional) If you would like to donate an item for the Chinese Auction please bring it before noon on Saturday and we will incorporate it. IMPORTANT: 2018 Membership sign-up or renewals are due at the December meeting - After this date, you will be dropped from both our GMQG and MQG membership rosters. We do not want to lose you!! The annual membership fee is $35 (Cash or Check). Please return any GMQG Library Books checked out. In December, we are going to establish a formalized "catalog" and check out program to begin in January 2018. Did we not have fun this past Saturday with Michele Blake? Her passion for making bags and zipper pouches was contagious. 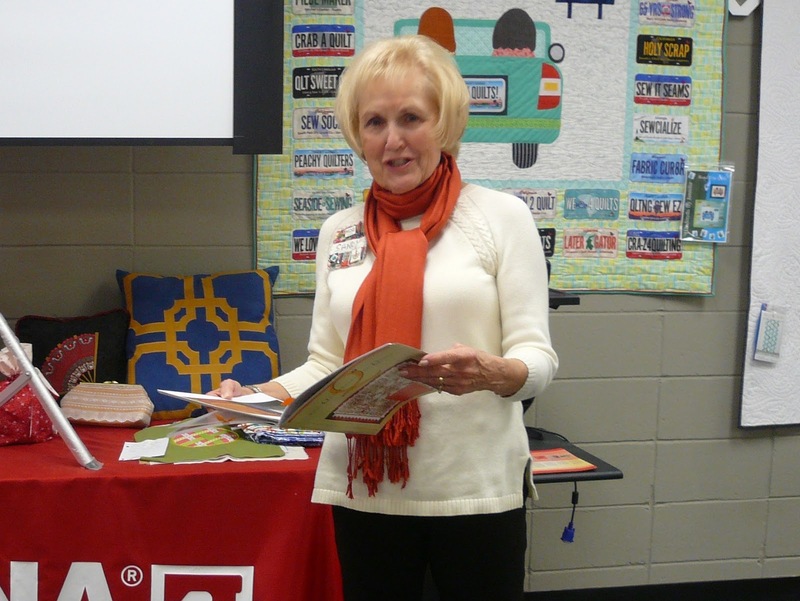 Through her wit, transparency and wonderful teaching ability, we all had opportunity to be immersed in her presentation as she shared about successes and failures in sewing bags and pouches of all sizes and design. For Michele, her bags and pouches need to have both form and function. So whether she makes them as gifts or keeps for herself, she wants them to look great and be utilized. To demonstrate her points, she brought for us to see: her beach bag, knitting bag, cords and earbud pouch, sewing tool bag, casual boho travel bag.... just to name a few. Make samples of your interfacing thickness. In the photo on the left, Michele made fabric and interfacing samples according to instructions, then wrote the name/type of the interfacing on the fabric side. 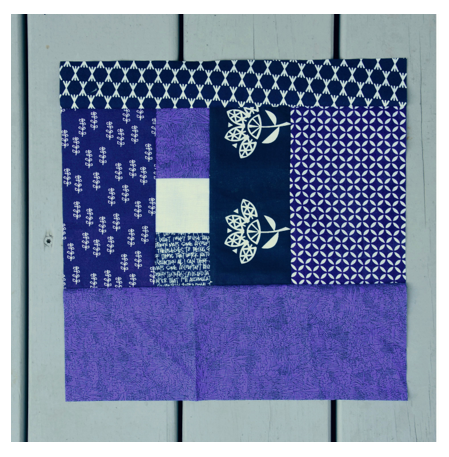 By having samples, she builds a library of different types of interfacing to better identify what she would like to use on a particular project or to be used in a pattern. Keep a notebook of ideas, designs and projects. 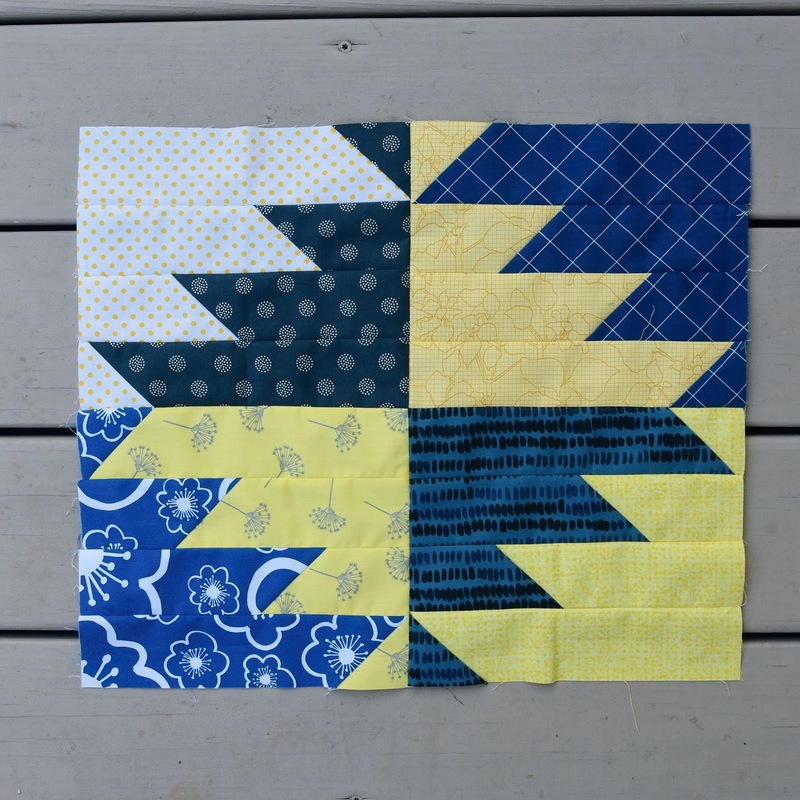 Take photos of your finished works, go online to find both free and purchased patterns and her favorite sewing tool to hold zippers in place prior to sewing or matching finicky seams.....is glue. Her two most recommended glues are Fons & Porter glue stick and Roxanne Glue Baste It. So, after visually being inspired by all of Michele's bags, for those who signed up for her afternoon workshop, we had opportunity to make one. Michele's wonderful teaching ability had our flat pieces of fabrics transformed into zipper pouches in just a couple of hours. I think we would all agree....it was a "BIG" success. Thank you, Michele. 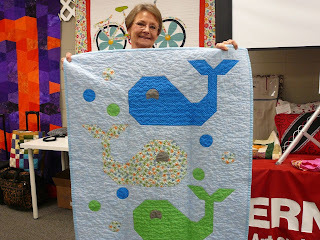 And, a huge thank you to Leslie White at Bernina Sewing Center for providing us a great space to meet and sew. We appreciate each of these women's talent and time in continuing forward the success of GMQG. In less than a month, this is what your generosity was able to achieve. It is amazing! Cindy and Faye extend a huge "Thank You" to each of you that participated. 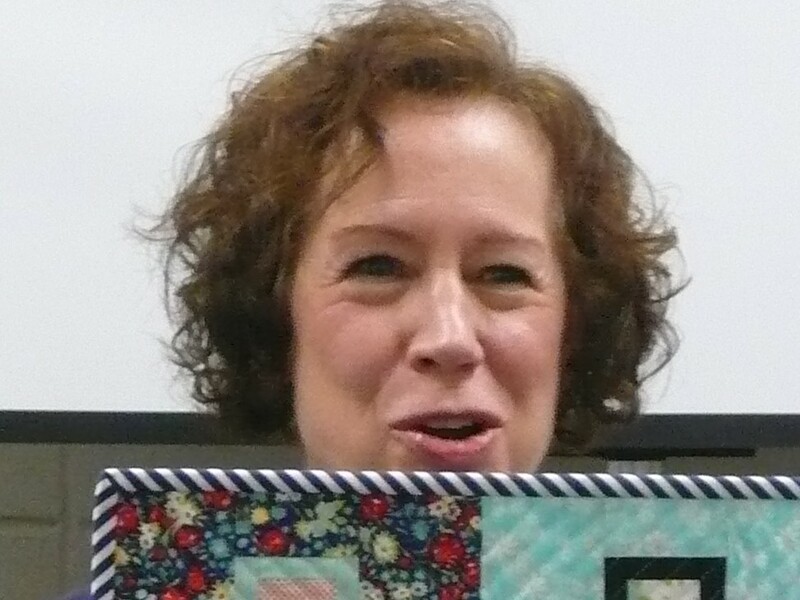 You came through with abundance of quilt squares. 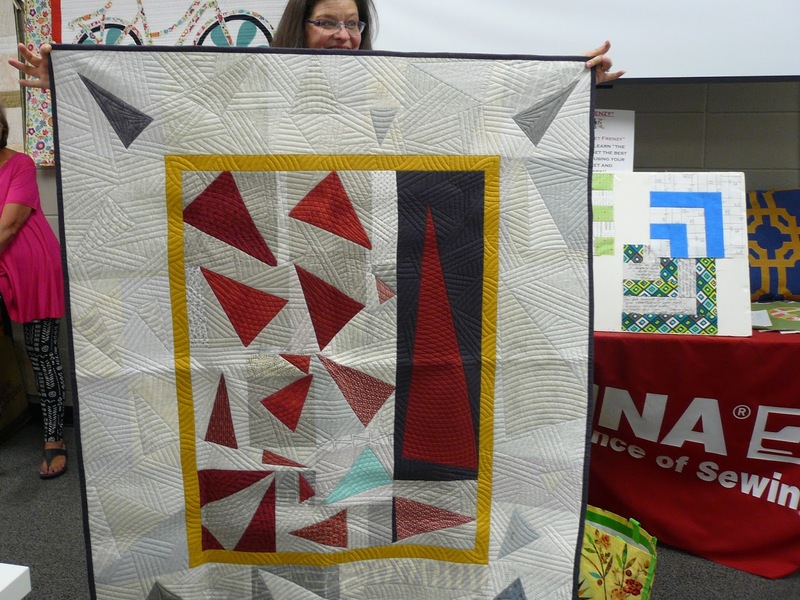 Additional, thanks and recognition to Leslie White, Paige Alexander, Faye Jones, Valorie Kasten and Cindy Lammon for their provisions of materials, equipment and/or time towards the quilting of the quilt. We thank Bernina Sewing Center for the wonderful 25% discount on fabrics this past Saturday. We appreciate each of you coming an hour earlier for the meeting. Nancy deJong reported that we had 30 in attendance with 29 members (in which 3 were new) and one guest. It's that time of year for Membership renewal or if you have been thinking about joining this is the time. The annual GMQG Membership fee is $35.00 Cash or Check. Why join you ask? Our new Board are planning the 2018 GMQG monthly programs. Incoming President, Susan Rink and VP, Valorie Kasten welcome your ideas and suggestions. For those who were not able to attend this past Saturday, you can email your suggestions to Susan Rink at srink100@yahoo.com or Valorie Kasten at spydeeland@aol.com. Please send before Friday, Nov. 17th. 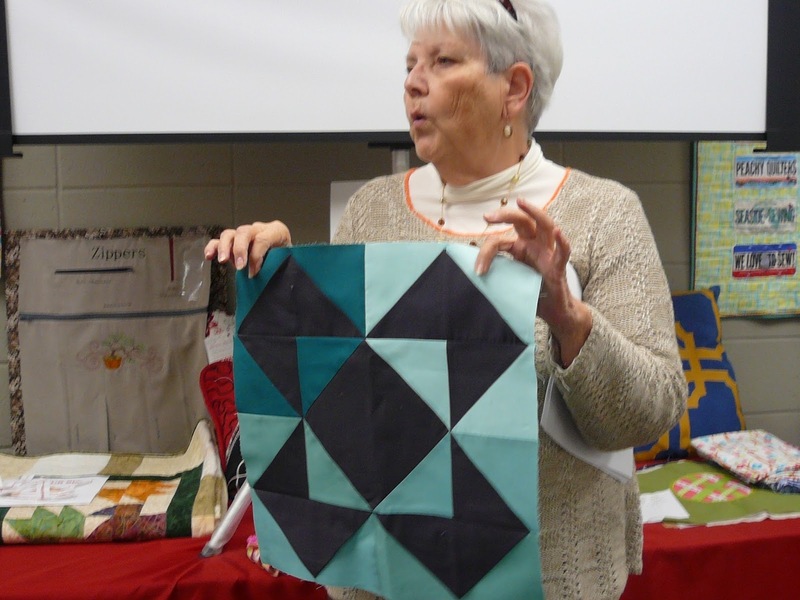 Quilt Sewing Classes with Johnnie McKenzie. 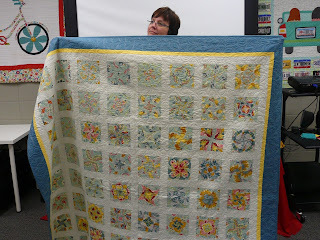 As Johnnie mentioned, these classes are "FREE" to members who would like to hone their sewing and quilting skills. Highlights of the class will be making a 16" Quilted Pillow Cover. This is a wonderful opportunity to learn from one of the best. If interested, please email Johnnie at johnniemckenzie@att.net for coordinating. Christmas is coming!!!! 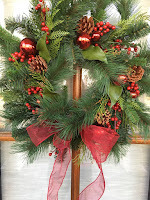 GMQG's Christmas Celebration will be Saturday, December 9th from 12:00pm to 3:00pm. As Cindy shared this is a time to enjoy the company of each other. We will be having a light lunch and desserts, Chinese auction and of course, Show & Share. If you would like to donate an item(s) to the auction, it is for a worthy cause. All the proceeds raised from the auction will go towards GMQG special projects and events as needed. Save the Date: GMQG Retreat 2018 at Wildacres Conference Center will be Friday, April 27th thru Sunday, April 29th. Faye Jones and Sandy Helsel are in planning mode. If you have sewing ideas for the retreat's group project, they would like to hear them. You can email email Sandy at shelsel65@gmail.com The retreat weekend cost will be $195.00 which includes housing accommodations, meals and gratuity. 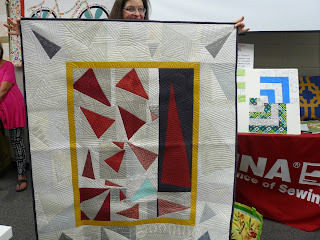 Cheryl Brickey has selected for the BOM a fun and very do-able design that when combined with other blocks has a high visual impact. The name of the block is Slab Blocks. Fabrics/Colors: Start with a 2 1/2" x 2 1/2" solid white square, then add colored stripes (prints and/or solids) of the same-ish color around the white square until the block measures at least 12 1/2" x 12 1/2" then trim to size. 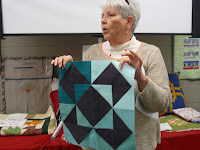 FYI - Cheryl Arkison's book Sunday Morning Quilts is available in the Greenville County Library for anyone who wants more instructions for slab making than are taught in the blog post. 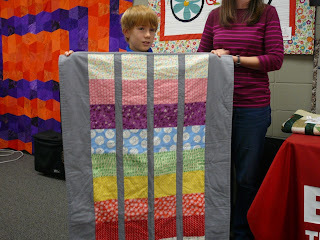 How many quilts did you count that were made for the GHS and Julie Valentine Center kids? It was 13....I think this is our record number..... We needed confetti to fall from the ceiling and horns to blow in celebration!!! 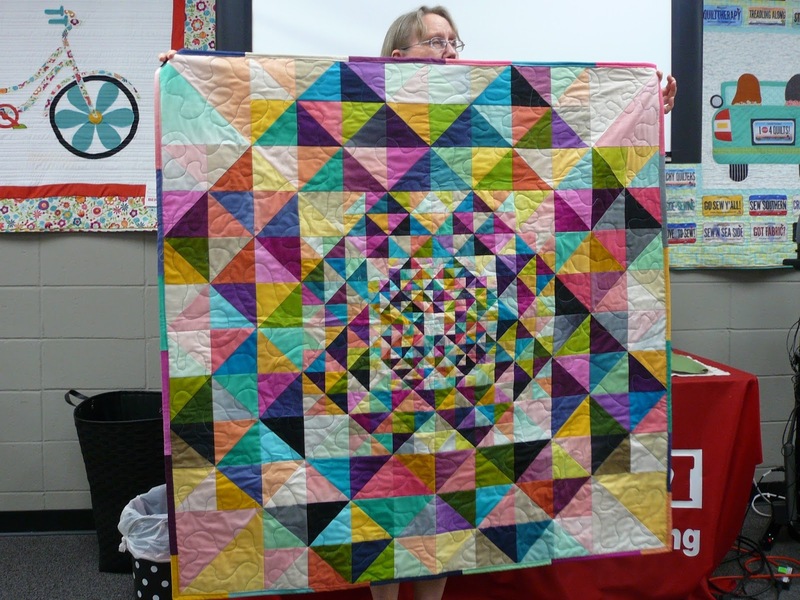 But instead, we can substitute paper confetti for the amazing colors in each of these quilts shown below in Show & Share. 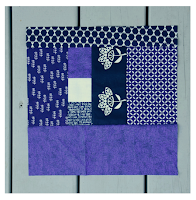 The fabrics, colors and individuality of each quilt just make you feel celebration. Thank you for your investment of creativity, materials and time for this worthy cause. You are applauded. 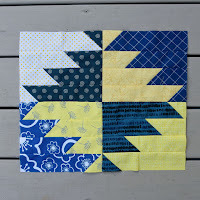 Elise Dunbar - her quilt for charity using GMQG's March Block of the Month - "X" Marks the Improv Block. Great job! 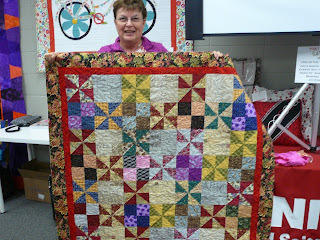 Susan Rink - (left) a special friend and quilt mentor 70th B-day surprise (right) the back of the quilt...So pretty! Happy Thanksgiving to each of you. We have so much to be thankful for. We hope you will mark your calendars for next month's Christmas celebration on Saturday, December 9th from 12:00pm to 3:00pm. Set out your mason jar to begin saving your $1 for the Chinese auction ;-). More information will come by email as the date nears.